The Tuscania, circa 1914, WikiCommons. Despite overcoming many close calls at sea, the Tuscania eventually met a tragic fate. Shipwrecks have held an enduring fascination with both historians and the general public, from the 1912 sinking of the Titanic to the 1915 sinking of the Lusitania, which arguably precipitated American involvement in World War I. However, there is a lesser-known shipwreck that has an Indiana connection: the sinking of the Tuscania. Built in 1914 by Alexander Stephen & Sons, Limited, in the Linthouse district of Glasgow, Scotland, the Tuscania originally served as a passenger ship. With a length of 567 feet and weight of 14, 348 gross tons, the Tuscania carried passengers between New York City and Glasgow for roughly a year before it was repurposed as a wartime ship. One of its earliest successes during World War I occurred on September 20, 1915. 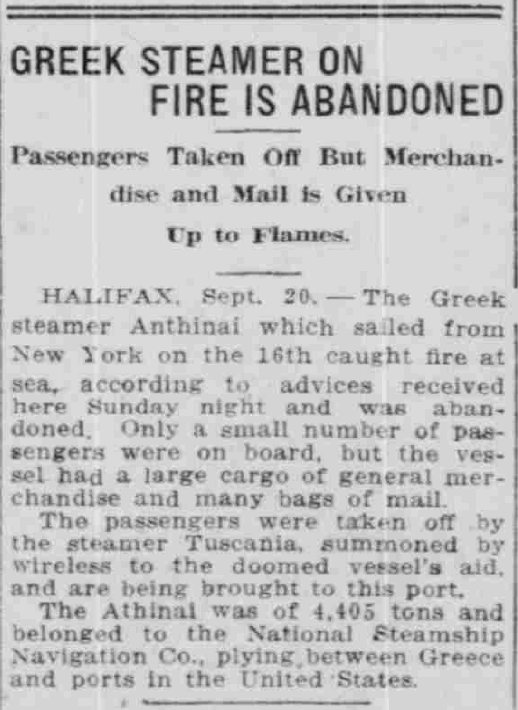 Anthinai, a “Greek steamer” ship that took off from New York harbor on September 16, caught fire off the coast of Halifax, Nova Scotia. 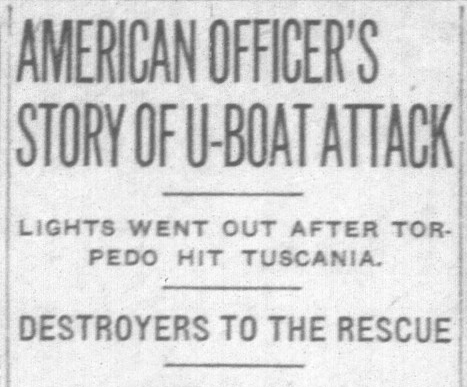 As reported by the South Bend News-Times, the passengers were taken to safety by the Tuscania, “summoned by wireless to the doomed vessel’s aid and are being brought to this port.” Whether or not the “fire” was caused by enemy forces is unclear, but the Tuscania’s valor during the episode earned it notoriety. South Bend News-Times, September 20, 2015, Hoosier State Chronicles. Nearly two years later, the Tuscania faced its first major crisis, and succeeded. On March 12, 1917, the Tuscania dodged an oncoming German submarine near the coast of Ireland. 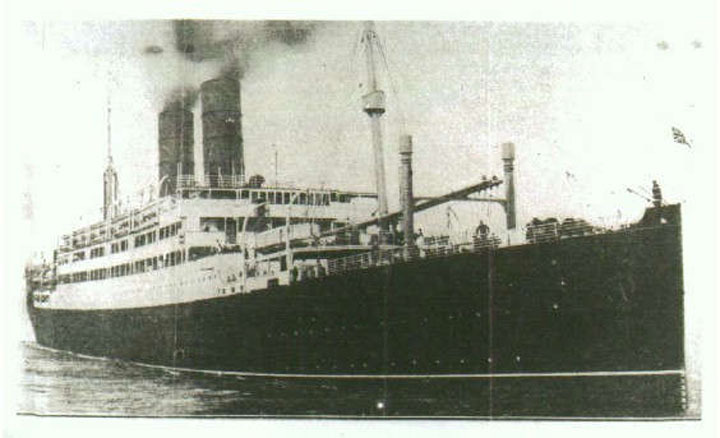 According to the Bridgeport Evening Farmer, the Tuscania moved away from the supposed submarine at “high speed, zigzagging in her course.” Even though Captain P. MacLean “denied that he had seen any submarine on the trip,” he did indicate that a foreign body was close the Tuscania and acted accordingly. The Tuscania’s first potential brush with destruction was not its last. 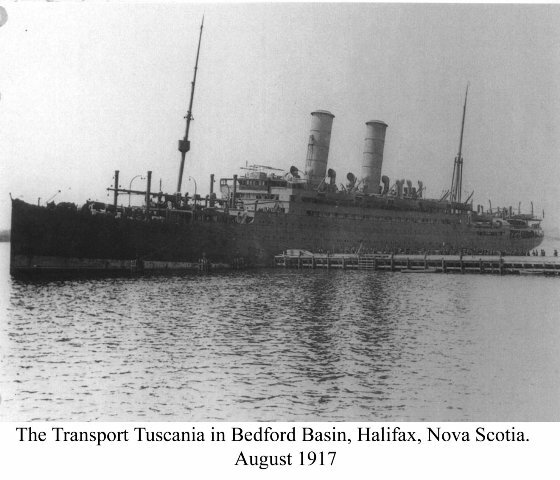 The Tuscania, in Nova Scotia, 1917, Forum Eerste Wereldoorlog. 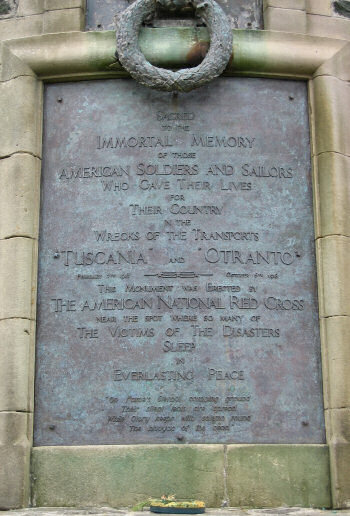 During a routine voyage on February 5, 1918, the Tuscania, carrying 2,179 American soldiers, was attacked between the Irish and Scottish coast by German submarine UB-77. Once it was reportedly hit by two torpedoes, it stayed afloat for nearly two hours, during which time over 200 people had initially drowned or went missing. By the time the story went to press, however, the official number of American casualties was 147; the number of British casualties was 166. 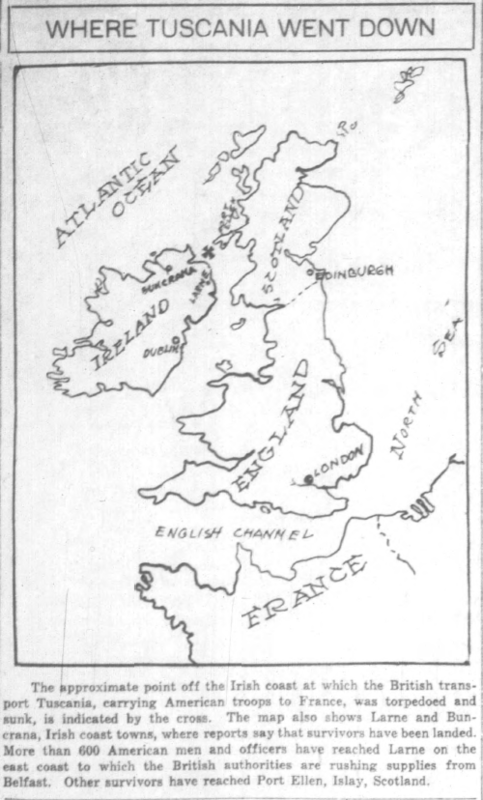 A map of where the Tuscania went down; the “X” between Ireland and Scotland indicates its location. Indianapolis News, February 7, 1918, Hoosier State Chronicles. Monday was a wild night. Had the disaster occurred during a gale I don’t like to think of what would never happened. But Tuesday evening was calm. The first intimation we had of possible danger was an order for all men to go on deck with life belts. It was about 4;30 o’clock. At the same time we sharply altered our course. At 5 o’clock, just as the darkness was setting well in, we got the blow. Nobody saw the periscope nor could one have been seen well. Some soldiers described having heard a hissing sound immediately before the torpedo struck us in the engine room. We were instantly disabled. All the lights went out. An order rang out sending the troops to their boat stations and to get the lifeboats out. The shock was not severe. It was more of a crunching-in felling [sic] that went through the ship than of a direct blow. There naturally was a good deal of confusion. You can not [sic] lower a score of lifeboats from the hight [sic] of an upper deck in the darkness without some confusion, but at no time was there a panic. From there, the officer stayed with the Tuscania as long as he could before another torpedo was launched (that fortunately missed) and the ship started to sink. Indianapolis News, February 8, 1918, Hoosier State Chronicles. Indiana newspapers quickly covered the story to see if any Indiana residents were aboard. According to the Indianapolis News and the South-Bend News-Times, a former Muncie resident named Max Lipshitz was supposedly aboard the Tuscania with the 107th engineers when it went down. When his brother, Abram Lipshitz, asked the US state department whether Max was safe, they gave him little information. Another Indiana native, Maurice Nesbit, was also considered missing from the Tuscania. Described as the “leader of regimental band with the Michigan national guard,” Nesbit had not been identified within the first 24 hours of the attack. W.R. Nesbit, Maurice’s father, tried to ascertain whether his son was safe or not. Fortunately for W.R., his son was safe and sound in New Jersey, having not been on the Tuscania at all. He informed his father of the news via letter, which was reported by the Indianapolis News. It was also reported that Lipshitz had also not been on board. While these two men had not been on board, there were many Hoosiers who were. Some survived while others perished. Of those that survived, three particular stories are worth recounting. As noted in the March 4, 1918 issue of the Indianapolis News, a survivor named Grover J. Rademaker of the 20th United States Foresters had written to his parents that he was safe. “I am here, and feeling fine,” wrote Rademaker, “and we are treated royally. I suppose you have read in the papers of our accident. I sure am a lucky boy, for I got out all right; didn’t even get my feet wet.” Another survivor from Indiana, aviator Joseph McKee from the 123rd aero squadron, was the only one from Lake County to come home. When news of his safety was given to his parents, the Lake County Times wrote that, “It is a happy day at the McKee home.” Finally, a young man named Archie Q. McCracken of New Albany weathered the attack and recuperated in an Irish hospital after sustaining minor injuries. Tuscania survivor Joseph McKee, Lake County Times, February 11, 1918, Hoosier State Chronicles. South Bend News-Times, February 19, 1918, Hoosier State Chronicles. Many aboard the Tuscania were not as lucky as Rademaker, McKee, and McCracken. Within a week of the sinking, the American casualty rate grew to 164, whose remains were subsequently buried in Scotland. 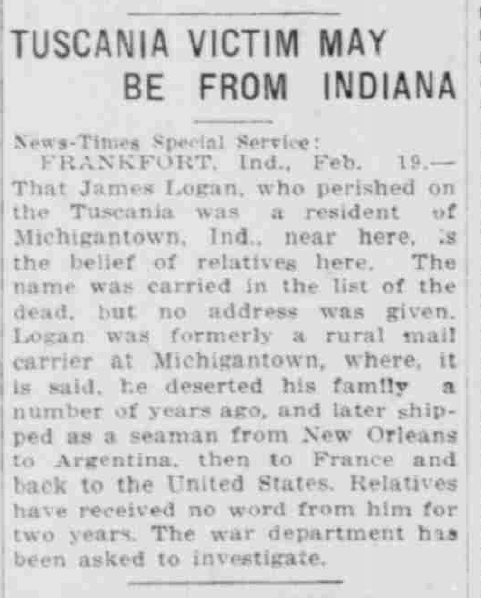 Among the lost was James Logan, a former Indiana mail carrier turned seaman whose family hadn’t heard from him in two years. They unfortunately never received the news of his safety. His name appeared on a list of the dead published in the February 13, 1918 issue of the Indianapolis News. Logan’s disappearance and death underscored the human cost of war and its impact on local communities in Indiana. A memorial ceremony for those lost on the Tuscania, isle of Islay, Memorial Day 1920. From the New York Tribune, June 20, 1920, Chronicling America. 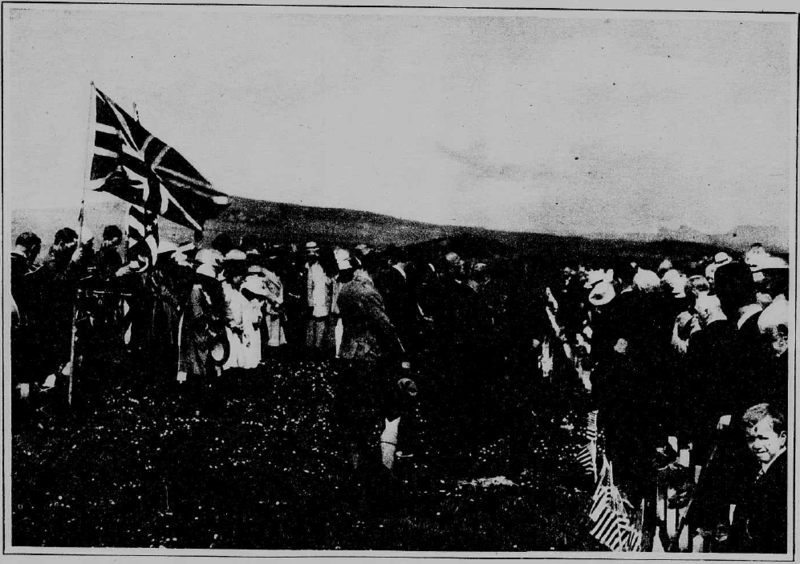 The monument at Mull, isle of Islay, Greencastle Herald, September 10, 1919, Hoosier State Chronicles. After the dust settled, preparations for a memorial to those who died commenced. The South Bend News-Times reported on March 5, 1918 that an, “American Red Cross contingent will arrive here [Port Ellen, Scotland] in a few days from London for the purpose of selecting a site for a monument to the American soldiers who perished in the Tuscania disaster.” Within a year, the monument at Mull on the island of Islay was dedicated to the American soldiers who died and the Glasgow Islay Association published a photographic book of the graves of Tuscania victims. This book was compiled as a “labor of love” by the association and offered to any family member of a lost loved one. On Memorial Day 1920, “Natives [sic] from miles around” Scotland gathered “about the simple graves of those several hundred fighting men, victims of the ill-fated transports Otranto and Tuscania” to pay their final respects on the isle of Islay. 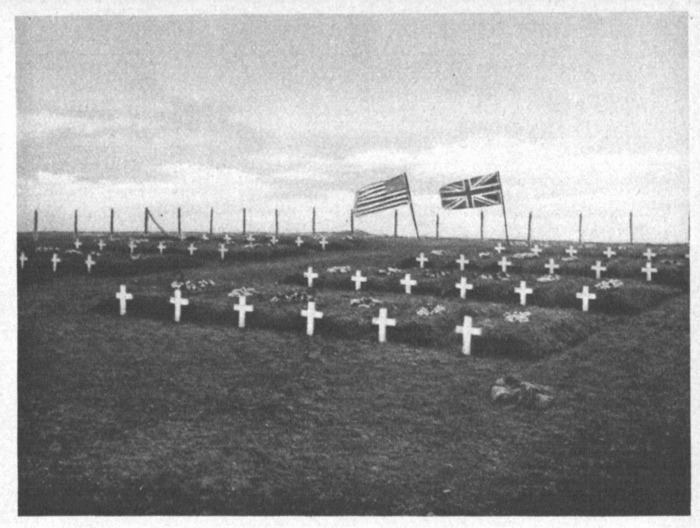 Graves of American soldiers that died in the sinking of the Tuscania, at Port Charlotte, Island of Islay, Scotland, Islay History. A plaque at the Tuscania and Ortranto memorial, isle of Islay, Armin Grewe. Today, the memorial on the isle of Islay is still standing, a fitting tribute to the resolve of those brave individuals who helped save lives, sadly went missing, or perished in the waters. The Tuscania bombing and its aftermath serve as a reminder that war carries a deep human cost, not only to those who die but to those who live with the grief of the loss of a son, father, brother, or friend. It also highlights the ways in which those from the Hoosier state find themselves halfway across the world, risking life and limb for their country during some of humanity’s darkest hours.